It's been less than a year but it's seemed a long wait for the return of ethical Bari lawyer, Guido Guerrieri, who made an impressive debut in INVOLUNTARY WITNESS. Guido, the lawyer who takes on cases others fear to take, is asked by a friend, a policeman, to take on the case of Martina Fumai. Martina wants to prosecute her ex-boyfriend who became violent and controlling in their relationship and has subsequently been stalking her. The courts are unwilling and the only recourse is to a civil suit. The catch is that Martina's ex is the son of a Bari judge and he is untouchable. Guido know this case could be the ruin of his career but he agrees to take it on. He is intrigued by Martina's friend and protector, Sister Claudia, a nun who runs the local women's shelter and a fellow martial arts fan. The case becomes even more difficult when it's revealed that Martina had had mental health issues at one time and was still seeing a therapist, but Guido is a good lawyer and has a counter strategy. 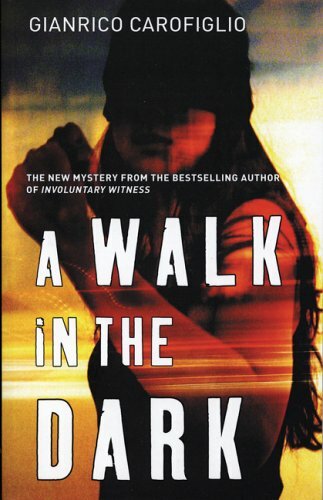 As with INVOLUNTARY WITNESS, A WALK IN THE DARK doesn't just cover the investigation/trial, more it is about Guido and his past and current life with the trial threading through at the appropriate times. Guido is such an attractive character, one that women will love and 'new men' would like to be. Bari is beautifully evoked and the whole story seems so grounded in real life it is completely believable. Howard Curtis's flawless translation is to be complimented as well. INVOLUNTARY WITNESS was a hard act to follow, but A WALK IN THE DARK is almost as good and better than nearly everything else I'll read this year.